Hal Roach first teamed Stan Laurel with Oliver Hardy in 1927, beginning a long and prosperous screen comedy collaboration. The pair became the movie’s most beloved, and funniest, screen team, a point that’s hard to argue against after a recent rewatching of BLOCKHEADS and SAPS AT SEA, two films that each clock in at less than an hour, but pack more laughs than many longer, larger budgeted films of the era – or any era, for that matter! 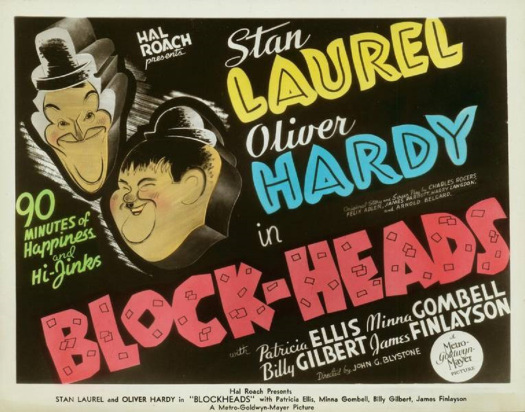 This entry was posted in Film, Film Review and tagged Blockheads, comedy, Cracked Rear Viewer, Gary Loggins, Hal Roach, James Finlayson, Laurel & Hardy, MGM, Minna Gombell, Oliver Hardy, Patricia Ellis, Richard Cramer, Saps at Sea, Stan Laurel, Through the Shattered Lens, United Artists. Bookmark the permalink.